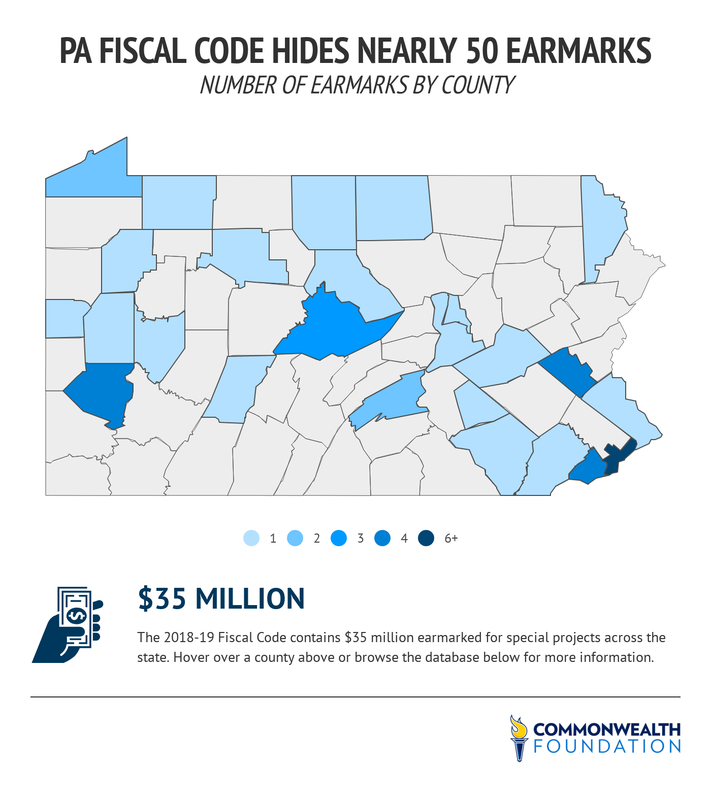 July 24, 2018, Harrisburg, Pa.—Nearly 50 obscurely-worded earmarks are buried in Pennsylvania’s fiscal code—amounting to $35 million in hidden expenses—according to a Commonwealth Foundation analysis. Click here for a searchable database of fiscal code earmarks. The fiscal code, passed alongside the state budget in late June, is an instruction manual for state agencies to use the funds allocated to them. But in recent years, it’s also become a breeding ground for targeted spending shielded from taxpayer scrutiny. For example, the fiscal code directs $900,000 to, “A community college in a county of the fourth class with a population of at least 175,000, but not more than 190,000, under the most recent Federal decennial census.” Commonwealth Foundation identified this as a Butler County community college. Another sends $2 million to, “A county nursing home located in a home rule county that was formerly a county of the second class A with more than 725 beds and a Medicaid acuity at 0.79 as of August 1, 2015.” We’ve identified this as a Delaware County nursing home. Another earmark allocates $5,000,000 simply to “A hospital.” Which hospital? That fact is known only to those who made this decision behind closed doors. Through analysis of earmarks in previous years, we believe this money will end up in Chester County.